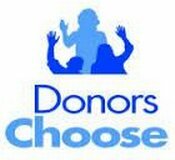 We are happy to announce that Mrs. Tew's donorchoose.org grant "Inspiring Middle School Students to Read" has been fully funded! HMS would like to thank all of the people that made donations to this grant. Our HMS library will be receiving $480.00 of new books for our students because of these generous donations! Thank you for helping us to inspire our students to read, read, read!